Think, March of the Penguins. 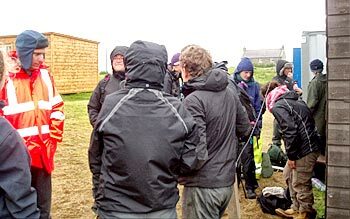 On a gale-battered, rain-swept, foam swept Ness of Brodgar this morning, 40 or so diggers huddled together in a penguin-like mass – larger ones on the outside protecting those on the inside who knew, however, that it would soon be their turn to be on the outside. The advertising for the film says, “contains mild peril”. And so did the Ness today. Nevertheless, work must go on. It was clearly impossible to set foot in the structures. Several were covered in black plastic, to protect them over the weekend, and large pools of water had gathered due to the heavy overnight rain. Adam reported that Structure Ten looked like a lido, albeit one in Northern Siberia. Those pools would have to be bucketed and sponged dry before the plastic could be removed, but even then problems would still lie in wait. The wind was simply horrendous and the Ness is, in any case, an exposed spot between the two lochs. Anyone who has ever been lashed in the face by writhing, wet plastic will remember the sting, and even attempting to lift the plastic could have sent several penguins (sorry, diggers) flying off to the Antarctic on a black magic carpet. So, in the end, common sense overrode valour and, as, the next bank of rain rolled in, digging on site became a non-starter. Yet, there were things to do. The field school students from Willamette University, Oregon, were volunteered for a spot of geophysics with the ORCA experts and were last seen, through the mist, clinging valiantly to a pole with a GPS unit on top. At least they had the comfort of knowing exactly where they were. Hopefully, this refinement of the previous results from the north end of the site may show the “Great Wall of Brodgar” more clearly and confirm its alignment, as previously shown in test-pits. Meanwhile, in the relative comfort of Mrs Hoey’s shed, other students were instructed in the setup and use of the Total Station survey equipment. Such a godsend, which speeds up, immeasurably, the survey work on site and the accurate recording, in three dimensions, of all of the finds from the trenches. Sample buckets and some special stones were loaded into the ORCA van for transport back to the Archaeology Department at Orkney College, in Kirkwall, for sorting and flotation (to recover carbonised material from the samples). 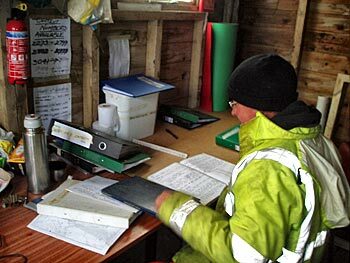 Meanwhile, in the finds hut, Anne declined offers of help by volunteers hoping to be out of the gale. There was a good reason for this. On a big site like the Ness, finds can accumulate quickly and each has to be assessed and dealt with individually. In that respect, a pause in the digging can be a golden opportunity for the finds people to draw breath, catch up with any backlog and plan for the next day. Similarly, the supervisors had the chance to get down to some serious paperwork, another aspect of excavation which can accumulate at an alarming rate. The fired clay object in anthromorphic form, the “Brodgar Boy”, which was discovered in Structure Fourteen, continues to fascinate those who see it. As envisaged before, the figurine had obviously been part of a larger object. The chances of finding its other “half” seemed slim, however, on Friday afternoon, it was found – only a metre, or so, away from the original find spot, by MAAP student, Stacey. It was a perfect fit. We can say that the form still looks anthromorphic but the use to which it may have been put is still a mystery. There is very little wear on it and its tapering, segmented form could represent a pendant, although those with vinous inclinations suggest that it looks like a wine bottle stopper! Again, and amazingly given the weather, an excellent number of visitors turned up, today, for site tours. One of the most heartening aspects of the first three weeks on site has been the numbers of visitors, but also the keen interest and considerable degree of knowledge they display. Hi, my name is Michael Lukas and I am currently an undergraduate student at Willamette University, in the US. I’m studying environmental science, archaeology and studio art at my university, with focuses in geology, ceramics and photography. I was drawn to this site as an alternative to studying abroad, as my current academic course prevents me from doing so. As a summer program, it doesn’t take time out of the academic school year – exactly what I wanted. However, I didn’t expect it to provide me with so many opportunities and change my views on how I would like to continue my education. 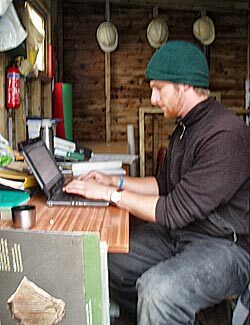 Michael escapes the rain to the relative dryness of the supervisor hut to write the diary. 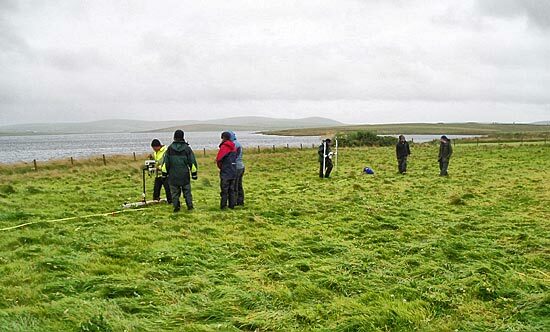 My time here, these past two weeks, has been extremely educational – not only from the lessons in proper excavation and survey techniques, but also from the many tours of Orkney archaeological sites, the tour of Rousay by the county archaeologist, Julie Gibson, and a lecture on the Orcadian Iron Age by Orkney College lecturer, Martin Carruthers. This education of mine is neverending, with it moving on to the paperwork and planning aspects of archaeology – context sheets, sections and plans of the part of the sites I’m currently excavating. Currently, I am excavating a cut between Structures Seven and Eight. There is little evidence as to what this cut may be, but there is a possibility that it could be the remains of a kiln added to the site late in its use. With only one quadrant of it excavated, so far, I am looking forward to any finds yet to come from it, whether it be the fragments of Neolithic pottery that cover the site, bits of flint, or the even more exciting unfired clumps of clay that pop up now and then. That said, the rain and wind have decided to drive us from the site once more, so we will return tomorrow, more enthusiastic than ever with hopes of finding more Neolithic goods, and enjoying another fantastic day out on the Ness of Brodgar.